Notes from a son: Not all of John Steve Moses’ World War II stories involved death, and many of the antics that might have led to time in the stockade were not recorded in these notebooks. One day I pressed Dad to tell me something funny that happened in the Pacific. Dad said that even after he was busted down from corporal he would still be called upon to take the lead on some recon or demolition missions. Part of the Recon Trooper’s job was to get rid of structures that could be used by the enemy, sometimes in advance of a larger body of troops. That sometimes meant going on patrol under a full moon and greasing-up with what he called “axelgrease” against moonlight. If one brought a watch, a patrol leader was to check the men and make sure the watch faces were hidden under the wrist to avoid a glint from a moonbeam. That’s how he often wore his wristwatch after the war. On one patrol they were tasked with torching a missionary village so the enemy couldn’t use it, the way the Japanese did at Ugli Village in 1943 when Pap Morrell fell on the beach to enemy machine gun fire. One building in the abandoned settlement looked like a church or a school, and there was an attic space. Dad was the one who went up the ladder with his rifle fully loaded. He popped open the trap door and above him was a dimly-lit figure with an upraised arm. He let loose a whole .30 caliber clip, and came down covered with plaster. Dad had just taken-out a life-sized statue of Jesus Christ holding a small American flag over his head. Other stories involved foraging for food in Officer Country. Let’s face it, when you teach a bunch of guys to sneak around and improvise, and then try to feed them tinned goat meat while officers got recognizable chow, that’s asking for trouble. Supply trucks must not have moved too fast behind the lines or been well-guarded, and at least once the officers found goat meat waiting for them, Dad said. Despite what he said about swimming in shark-infested waters, he later fondly recalled taking a dip while guys on high ground with rifles kept an eye out for predators. After the foxhole incident, where the Japanese soldier with the bayonet jumped in, Dad once recalled that he rigged special booby traps around his foxhole to keep that from happening again. Guys would call out when it was time for him to pull guard duty or go on patrol, because nobody was going to walk right up to his special security system. Below is the end of Dad’s combat career. It’s been exactly two years overseas today, two years of hell and fun. If our luck holds out we’ll come out O.K. I have to admit we have pulled out of tight spots. I’m the driver of a command car now, big-time stuff. The Japs are going to town in China, losing their airports fast. I believe instead of the Philippines we’ll all end up somewhere in China. Anyplace would be better than these God-forsaken islands. MacArthur finally hit the Philippines and had quite a beachhead on Leyete before the Japs woke up. Our Navy is giving the Japs a lesson in basic naval warfare. They’ve had three good scraps so far, and the Japs are coming out second best. Some Navy bigwig predicts now we’ll even hit China because we can use airports. Only 700 miles from Hong Kong and Shanghai now. We have our area built-up really classy. All the tents are in a line and we even have flowers planted in front of tents. Now that we’re set up we’re sure to get orders to tear it all down because we’re moving again. We never get moss on our feet. (Name unreadable, starts with an ‘S’) was taken sick with fever, which later developed into scrub typhus and got serious. He died today, Oct. 30, and had been unconscious for the last few days. We’re really going to miss him because he was one man in a million, the life of every gathering and a swell ball player. He lived in St. Louis. Now his folks are going to hear of his death instead of his rotation. I got kind of sick again last nite. I still can’t get over my attack while at Yakamo. I believe I’ll go on sick call tomorrow to see what’s up again. Nurses came in last week, and with them came trouble and rumors galore. They don’t think much of us GIs. During their initial appearance at a movie they came with .45 caliber pistols and had officers with them with loaded carbines. Trouble came later when two enlisted men tried to get in their quarters while drunk. Both have about 11 counts against them, good for a vacation in Leavenworth. Only officers can enjoy their company. As representatives of American girls, they stink. Our radio officers who stayed on O.P. with Aussies are being forced to move O.P. because a group of Japs are on their trail, Japs from Wewak on patrol or something. The next day our planes bombed the village our O.P. had been in, and there’s no word from our boys as to where the Japs got to or if the bombs did the work. The boys are due back in camp between the 1st and 5th. Of November. Another rumor last nite was that 18 natives raped three nuns on the island across from us. The penalty for that is death by hanging if it’s true but, if true, it’s more than just. Radio Tokyo scoffs at our claims, but not with the happy tones she used when we were at the Russells. From all appearances, Japan is in one hell of a spot, and her good friend Germany has plenty of headaches, too. The boys are out on a four-hour hike now, there’s a nice, full moon but it’s very unlikely to be appreciated by tired men. I stayed behind in camp because I don’t believe I could take it. It’s payday tomorrow, and the next day will start our 26th month overseas. Here are some shots Dad took, most likely at his final post. The guys in the top photo are “The Bassey Group,” comprised of 1st Lt. Chapman, 1st Sgt. Wasp and S/Sgt. Sciarra. When Dad wrote notes on the back of the photos, Wasp and Sciarra were in the hospital. The middle photo is a military vehicle labeled “Good Old Horse.” The 43rd Cavalry was mechanized. I got some negatives back I took while on patrol – three short because they showed Japs unburied at a village we burned to keep the Japs from using. And our censors are afraid the Japs wouldn’t like it. Boy! Are we suckers. Natives are banging away on drums so some ceremonial dance is going on across the river. I sure hope they’re not mad at us tonite. I’m sleepy and I hate to be disturbed. Lt. Ouzts killed a 10-foot snake. That would be nice to find on your pillow. I went on sick call and was sent back to the 118th again, my third trip. Let’s hope it’s my last. I’m here for observation of syncope, whatever that is. I saw plenty of movies here, two in the rain, and there are softball games every nite. I don’t know what the docs found, but I was sent to the 37th Station hospital. It’s very nice here, beds, pillows and mattresses. The chow is O.K. and the treatment is the best so far. More check-ups, blood tests and high blood pressure. We had nurses here, but before I got here they moved. Tsk, tsk. The doc told me I’m to be evacuated either to Hollandia or French Haven. I was back to camp on a pass to see the boys, almost like going home. I had five Xmas parcels I split with the boys. I felt kind of funny leaving camp; I may never see some of my pals again because no one knows where I’ll end up. I boarded the Hospital Ship in the harbor, really a lulu and comfortable. One good point is it’s not crowded and the food was excellent. They even had ice cream and fried chicken. They had beer every afternoon. I swapped mine for root beer. The nurses were really swell to us boys and did everything to sheer us up. We left the harbor with all the lites on. It seems funny to go this way when we’re used to blackouts. We stopped over at New Britain to pick up a patient but since they had only one we kept on going. We sighted land late afternoon and pulled into Finschhafen and docked alongside another ship. We stayed on overnight but got off after breakfast and came here to 237 Sta. Hospital. It looks O.K. The nurses are friendly but, as usual, they’re checking my blood, etc. There must be something wrong somewhere. The doc asked all kinds of questions, it could be here I’ll get results. They have a Red Cross here, we heard Negroes sing last nite, pretty good. Capt. Brown, in charge of the ward, diagnosed my trouble as a bad case of nerves, etc. He’s a nice guy for a medic. Gave us lectures most every day but claims in time we’ll be O.K. I hope they don’t believe I’m too sick over here, but it’s tough not knowing when we’re so far apart. The Maetsuycker, a Dutch Registered vessel, 4,131 GRT, 361 ft 6 in (110.2 m) in length, owned by Koninklijke Paketvaart-Maatschappij (KPM) of Batavia, Dutch East Indies was completed in 1937. 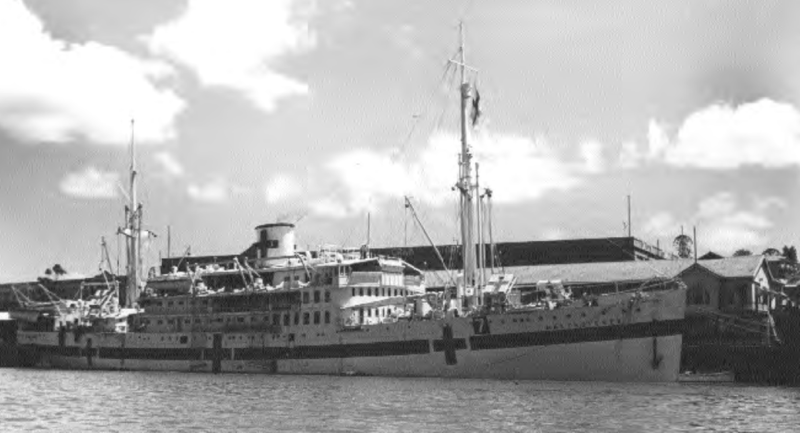 She was converted to hospital ship at the cost of the Dutch government, crewed by Dutch Officer’s and Javanese (Indonesian) sailors to treat transport 250 patients. She sailed under the control of the US Army for intra-theater use, but was a Dutch hospital ship flying the Dutch Flag and certified by the Netherlands Government under the Hague Convention. She served in New Guinea and the Southwest Pacific Area (SWPA) as part of the SWPA Command’s permanent local fleet with the local “X” number[Note 1] 12. Maetsuycker officially became a U.S. hospital ship at a ceremony 4 February 1944 with an address by the Consul-General for the Netherlands. U.S. Army medical personnel staffed the hospital facilities. I was at the 237 for only 26 days when the transfer came in for the 13th General Hospital. The 13th General Hospital is pretty good. the nurses and doc s treat us as humans. Boys are leaving from here to the states. It sure makes us feel funny to see fellows leave for home. On Christmas Eve we went to Midnight Mass, my third Xmas overseas. Christmas Day was hot as hell. We have a tiny Xmas tree on the nurse’s desk. I put a can of Spam under it, but she didn’t appreciate it. I got the best Christmas gift a guy could ask for. Doc told me I’d be boarded at 1 o’clock. I went before a board of a captain and two colonels, and I believe I’m on my way home. Now it’s only a matter of time before I get on board a ship for home and the folks. It still feels like a dream. I was given a bag of woolens, etc. that brings (unreadable) one step nearer. Now we’re all anxiously waiting for a boat to go back o.
I’ve seen plenty of movies, but last night’s USO show was tops. Saw four Conoly Cover Girls featuring “Conoly Jones.” It was really O.K., even if I sat on a hard bench three hours before the show. New Years we came in quiet and we had few casualties by drunkenness. It seems liquor is mighty scarce here. We boarded the Bosche Fontaine on Jan. 6, 1945 and sailed immediately – a Dutch troop transport. We had 600 patients on board, including WACs and nurses as patients. I felt pretty good seeing the lights of Finschhafen fade away. I had quite a coincidence on board ship when I found another John S. Moses. Both of us are Pfc.s, so as a result he took all the K.P. on the way over. I lived the life if ease. That’ll teach him to steal my name. Editor’s Note: When the John S. Moses who got stuck with double K.P. finally met my Dad, he had some colorful words to share. I was on board ship 21 days and the meals were pretty good. We had only one alarm. Some psycho patient was let out for air and decided to jump overboard. He was caught ion time but his life jacket fell overboard so some sailor gave the alarm (Man overboard!) the ship stopped dead and bells started clanging. For a while I figured we’d been attacked by subs or planes, but everything turned out O.K. We had abandon ship drills most every day – really nice days – and plenty of sunburns resulted. The sea got heavy as hell a week out of Frisco and the boat seemed to be doing a balancing act. I saw an aircraft carrier going out into the Pacific. We heard a direct broadcast from the States for the first time in years. It sure sounded swell – we heard the Post Toasties program. The morning of Jan. 26 we all got up earlier because land was to be sighted. It sure felt nice to even see a light off somewhere. Our pilot pulled up in pitch dark and headed us in for shore. We saw land at dawn and everybody realized we were home at last – home up to now was a word in the dictionary. We pulled into Frisco Bay and that Golden Gate never looked better. When we sailed under it everybody cheered – with the exception of myself. I was too choked-up. We got off the Bosche Fontaine at about 10 a.m. they had a band play while we disembarked. We got into the hospital buses and found a woman driver. She got us to Letterman General Hospital, so she couldn’t have been too bad. We really rubber-necked and looked at everything. The States sure looked plenty O.K. We had our first meal as soon as we hit the wards – we went to a beautiful mess hall and had fresh food galore – most of us ate to excess. While we lined up to get into the hospital Red Cross workers gave us a pint of milk and a sleeveless sweater. That milk sure went over swell. I sent a telegram home, and to Violet. We went all over the place, and everyone agreed Letterman is one swell hospital. I spent the first night at the Red Cross, played hearts and lost. We saw a swell stage show put on my civilians from Frisco nite clubs at the Red Cross. Buses took us to a hockey game. We had on hospital uniforms so we stood out. We got a swell welcome from the people. We saw Frisco on a sightseeing bus, pretty good. We also attended a concert at the Symphony Hall or something, we heard the Dan Cassan Chorus. We finally found out we were to be split up and sent to hospitals all over the states – I’m to see Wakeman Gen’l & Conv. In Indiana. We got on a hospital train and started off closer to home. They had beds fixed in coaches, so we slept and looked at the states all the way. Even our meals were served by ward boys, so as a whole our trip was swell. I saw snow at Sacramento, Calif. and went through Utah, Colorado, Kansas, Missouri, Illinois and Indiana. I got to Wakeman at nite on Feb. 2. It was colder than hell. I was sent to the convalescent area. Some fellows took off pronto. I hit the hay and called up home the next nite. It sure was nice talking to the folks, and Violet. Mom and Louie were waiting at the gate. It felt good seeing them, even if I looked like something the cat dragged in. I had a 15-day furlough and got sick immediately – malaria sick. I was home 6 days and spent 7 in the Fort Wayne Hospital. I must have scared the hell out of everybody. Liz came over to see me but I was O.K. when she arrived. I got a 7-day extension. I had plenty of passes from the hospital, so no complaints. I was sick as hell on my birthday, Feb. 26, but since Violet, Olga, Pearl and Elaine came over to help eat cake I came down – I went to the hospital the next day. Elaine gave me a wallet. Bab’s scared stiff of me or something. I got engaged to Violet on March 9. John Steve Moses, in uniform, with Violet Margaret Moses in Detroit, Michigan on Easter of 1945. They were engaged on March 9 of that year and were married until he died on May 1, 1983. I got a 17-day leave again while the other guys start in processing for discharge. I had malaria again, but not too severe. It seems “furloughs” and “malaria” come about even for me. I went before two boards prior to C.D.D. I believe I’ll be out and a civilian by July 4th. Dentists fixed all my choppers, even made new ones for the missing ones. No trouble with them at all, since I leave’em in my foot locker. I was discharged from the Army on June 22, Friday, at 1 o’clock – that’s all.